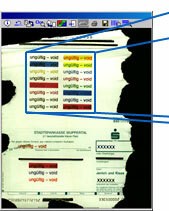 Scanning in Color, Gray, or black & white at the same high speed is just one of the major strengths of DpuScan. Besides data entry through user-defined dialogs and the quality control of scanned paper batches, it is possible to perform image enhancement at the same time, and to recognize barcodes, patchcodes, and any text. Images are automatically saved and sorted through extracted document information. Automatic skew correction is no problem, even with extremely damaged paper! Integrated filters and image enhancement methods make nearly unreadable sections readable again!